Stories of King Arthur and the characters around him have been a large part of my reading diet for as long as I can remember. I’ve read classic retellings, obscure retellings and a desire to discover the early retellings is what led to me becoming an unemployable medieval English postgraduate. They’re stories that have become very close to my heart and I feel absurdly protective towards them, so I was excited and apprehensive in equal measures when I won a free review copy of The Circle Cast by Alex Epstein from the LibraryThing Early Reviewers programme, subtitled as it is ‘the lost years of Morgan le Faye’. The Circle Cast aims to fill in the gap between the time when Morgan is first seen as the daughter of Ygraine and Gorlois, Duke of Cornwall, and when she later reemerges as Arthur’s seductress and the mother of Mordred, his eventual downfall. How does a young girl who is sent into exile, either for her own protection or simply to keep her out of the way as Uter Pendragon begins a passionate relationship with her mother, become a powerful and vengeful sorceress? Perhaps because Alex Epstein chooses to address Morgan le Fay’s childhood, an area of the legends which is not traditionally covered (in fact, only The Mists of Avalon by Marion Zimmer Bradley springs to mind) and so is able to create entirely new material, I found this book rather enjoyable. It used a familiar setting and some familiar characters but it didn’t trespass on the traditional stories: it added to them instead and I found this a refreshing and interesting approach. Morgan, or Anna as she begins the story, is a surprisingly complex character who develops convincingly throughout the course of the novel. She starts out curious, questioning and vulnerable but quickly acquires a steely resolve and an adult mindset as she is forced to mature by her circumstances. She’s so controlled and self-sufficient for much of the book that I don’t find her a particularly sympathetic character, but she’s still really interesting and a great strong female protagonist for a young adult story. I thought it was particularly poignant and a clever touch that what she works towards in Ireland, unification under one High King, is exactly what Arthur later works towards in Britain. Of course, approaching such well known stories in any way, even Epstein’s rather oblique one, creates a set of problems for the author and reader. It can be difficult to create tension an excitement in a story where the reader already knows the ending, and I was well aware that the question posed on the back cover of the book, ‘But when Morgan meets the handsome son of a chieftain, will she choose love or vengeance?‘ was not really a question at all. Almost everyone reading this book will know that Morgan returns to Britain, seduces Arthur and gives birth to Mordred. The tension then has to come from the writer either making the reader forget that the conclusion of the novel is inevitable or making the choices that the characters have to make so agonising that the reader wishes there were some other option. Every time I go to see Blood Brothers I always find myself hoping against hope that this particular time it might end differently, despite all rational thought meaning I know it can’t, so I know that this can be achieved. in The Circle Cast Epstein manages it as well, by and large, and even though I knew what Morgan would decide her situation was compelling enough that I caught myself wishing that this wasn’t the case. I also liked the way that, although the reader was never allowed to forget the connection to the Arthurian story, Epstein worked in other stories subsidiary to Morgan’s which provide context. I particularly liked the story of Luan who wanted to live a Christian life of prayer rather than the life of a chieftain’s daughter. The way in which she dealt with achieving her aims in a male dominated society provided a contrasting counterpoint to Morgan’s situation which added richness to the story. Now, to the best of my knowledge, there are no pelicans in the Irish Sea, nor have there ever been. Puffins, yes. Seagulls, yes. Pelicans, no. A quick Google suggests that they don’t come any closer to the British Isles than the extreme south east of Europe. The other issue was equine, when Morgan discovers a three-toed horse, which she takes as a special creature. Once again, the best of my knowledge is largely represented by Wikipedia and consultation with some horsey friends, but nevertheless sources seem to agree that equus has one toeand the mesohippus shown on this diagram with three toes horses died out around 40 million years ago, which is a little old for Morgan to be riding one. I am of course not an expert on historical zoology and this isn’t to say that I’m not wrong; Google, after all, is not infallible. However, even if these animals are technically correct, they don’t feel as though they fit within the locale and time period that Epstein is evoking and so they would have been better substituted for more typical wildlife which instantly suggests Dark Age Britain. Edit: Apparently I’m wrong about the horses. They do occasionally come about as a genetic throwback, and Julius Caesar’s horse Beaucephalus had three toes. Knowing this, it actually makes Morgan’s three toed mount a rather clever idea rather than a slightly peculiar one, as it places her in a context of great leaders. Thanks to the author for clearing that one up. My other problem with the book was the inconsistent timescale: the amount of time that Morgan spends in slavery seems to vary hugely. When she escapes to join the Christian community, we are told that ‘Morgan tucked into her first proper meal in eight years‘ (p. 142); later she rescues the Greek slave who came to Ireland with her from Cornwall and ‘she could see he was trying to turn the twelve-year-old he had lost into the sixteen-year-old in the white cloth and gold that stood before him’ (p. 240); later still she meets the man who enslaved her and ‘The head on the grass was ten years older’ (p. 244). Even a brief glance shows that these timings don’t match up, and I wish that some more careful editing had picked this up so that it could be fixed. With these two exceptions I really enjoyed this novel. I like Alex Epstein’s writing and I get the feeling that we’d get on rather well if we ever met, and would spend hours geeking out over Arthurian legend. I hope he continues to write more stories in this vein, perhaps continuing with Morgan’s tale, as I’d really like to read them. 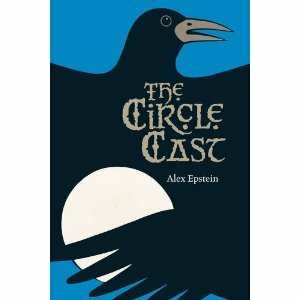 The Circle Cast by Alex Epstein. Published by Tradewinds, 2010, pp. 300. Originally published in 2010. That cover caught my eye, but I can’t say it said “Arthurian”. I love retellings from a different angle, and this sounds as though the positives more than outweigh the negatives. I’ll look out for a copy. I definitely recommend it. It’s a quick read as it is aimed more at the young adult market, but that doesn’t prevent it from being a good one.